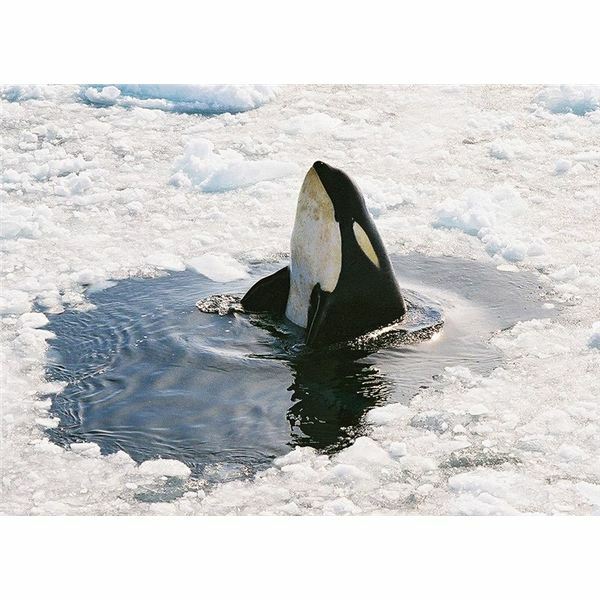 Orcas (killer whales) have adapted to a wide variety of environments. They are widely distributed being found in all the oceans of the world, however, they are more abundant in cooler waters. Killer whales seem to travel according to the availability of food sources rather than migrate yearly like some other whale species. According to killer whales animal behavior, seasonal movements are influenced by the migration of its prey. Killer whales are social creatures. They generally live in groups, known as pods, consisting of several females, one or more males and the calves. Pods may consist of anywhere from 2 to 15 whales, although some groups may have a hundred or more. The females are very protective over their young and several generations of Orcas have been noted traveling together. Killer whales will even care for sick or injured whales within their social structure. The social structure seems to vary somewhat in transient (not permanent residents of the area) groups, where the whales may not be related and the offspring do not remain with their mothers as long as in resident whale pods. Killer whales hunt in groups consisting of approximately 40 whales. Their diet may be specific according to geographic location and/or population. Transient whales may prey on different animals than resident whales and may use varying techniques to capture their prey. Resident whale groups tend to prefer fish such as salmon whereas transient pods prey on seals, porpoises and other cetaceans. Depending on the location, killer whales may also prey on sharks and stingrays. There is little known about the mating habits and breeding patterns of killer whales although it appears that mating can occur at any time. Killer whales become sexually mature between 10 to 18 years of age. It is believed that females are still able to reproduce at the age of 40 or beyond. Females generally bear one calf every 2 to 5 years with every 3 years being the average. The gestation period is approximately 13 to 17 months. The newborn calf is about 6 to 7 feet long, weighing approximately 400 pounds. Killer whales communicate through a wide variety of sounds such as clicks, whistles and pulsed calls. It is believed that clicks are used mostly for navigation and to locate prey while whistles and pulsed calls are used more for communication. Pulsed calls sound somewhat like a squeak or squawk to humans. Although all whales have some sounds in common, each pod uses specific sounds that members of the group will recognize. The communicative sounds are distinct in some pods even within the same population. Resident groups travel a direct route within a specific range whereas the movements of transient whales tend to follow the shoreline. The hierarchy of killer whales is dominated by females and they may establish their rank through certain movements such as slapping the tail against the water, biting, butting heads and other postures. Killer whales also discipline their young using tooth scratching, a behavior known as raking. Killer whales have been observed rubbing their bodies off the pebbly bottoms of shallow bays. It is uncertain why they do this and it is believed that this particular behavior may serve to relieve itching or remove external parasites. Killer whales engage in leaps and other playful movements. They have even been observed harassing other marine mammals.